Scotland was first settled roughly 10,000 years ago after the end of the last ice age. The first reference to the people of Scotland comes from Roman sources that referred to the people north of Firth of Clyde and Firth of Forth as Picts, and whose territory was referred to as Caledonia. 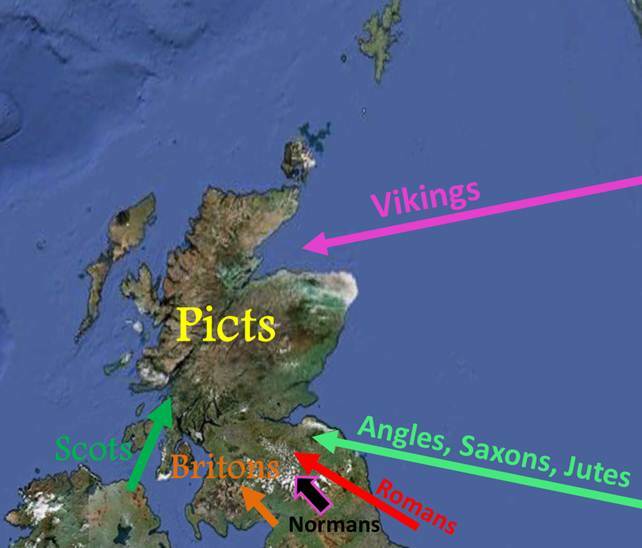 In 410 AD the Roman army withdrew and the areas above (occupied by Picts) and below the Antonine wall (occupied by the Roman-influenced Celtic Britons) were subject to Invasions from the 5th to 8th Centuries by 3 different population groups; Scots from Ireland, Anglo-Saxons from the continent, and the Norse from Scandinavia. The extent to which they replaced native populations, or have contributed to the genetic make-up of Scotland remains to be determined. DNA analysis may indeed shed light on this. The Gaels and their Gaelic culture gradually overwhelmed or assimilated the Picts in the North, while the Anglo-Saxons predominated in the south. It was Anglo-Saxon language, a variant of early English which eventually became the predominant tongue of lowland Scotland, while the Gaelic Scots gifted the Gaelic language spoken largely in the Highlands and Islands. The Viking invaders eventually took hold of the Western Isles, Caithness, Sutherland, Galloway, Orkney and Shetland giving rise to the Mercenary Viking-Scottish warriors known as Gallowglass. The last of the medieval settlers the Normans, distant relatives of the Vikings, were invited into Scotland by King David 1st in 1124 AD. King DAvid was greatly impressed by the governmental and cultural innovations introduced by them into England.